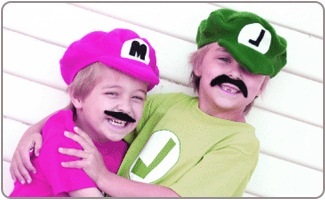 Super Mario Brothers have been a popular video game duo since the 1980s when the very first game came out. 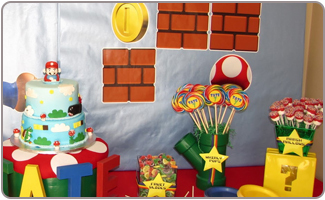 There are a variety of Super Mario birthday party ideas possible taken from any of the many versions of the game that have come out since their inception. Super Mario party ideas can come from the original game, the newer versions, or Mario Kart, the racing game. It's hard to have a Super Mario birthday without playing any video games, so plan to have a few extra controllers and even an extra console if possible so everyone can have a turn. 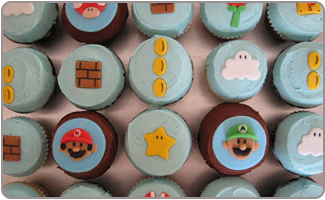 Although indoor parties are usual, there are Super Mario party ideas for an outdoor gathering as well. You can use Super Mario party supplies to create a great outdoor space. Choose one of the many Super Mario games to work with as a theme, or make it a general theme for ease. Consider holding the party in a video arcade, since the Mario Brothers are from a video game. When choosing the party venue and plans, be sure to consider the age of all attendees – some may be too young for video games. 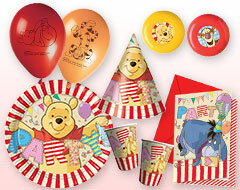 You will find lots of Super Mario birthday party ideas for invitations in our great stock of birthday party supplies. 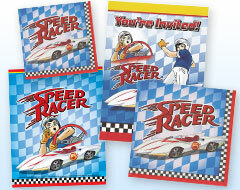 Pre-made party invitations are simple and fast. Create invitations out of mushrooms. Simply cut a mushroom shape and add dots. Write the party information on the back. An easy homemade invitation is a yellow square brick, a famous symbol from all of the games. Make cards with this on the front, and fill the information on the inside. 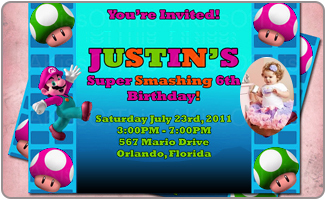 There are many Super Mario images available online; you can use any of them to create your own invitation with photo editing software. 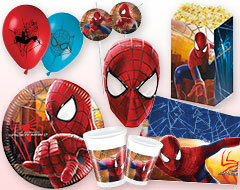 Use cut outs of Mario brothers, gold coins and a picture of birthday child in one of the gold coins. Use Mario terminology in your wording, like "power up and come on over" to make the invitations more fun. 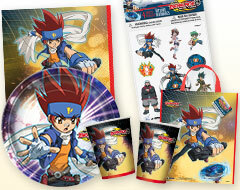 Send the kids on a coin hunt like the coins in the game. Hide them around the house and see who can find the most coins. Super Mario bricks can be the back of the cards for a game of memory. Cut squares of yellow construction paper and glue images of the characters from the game on the other side. Make sure there are two of each. See who can find the most matches when they are turned upside down. Create an obstacle course for the kids to run a race, including things they must jump over and items to collect along the way, mimicking the game. Let the video game be a part of the party, but make sure everyone takes turns and no one spends the whole day playing. Create three question mark bricks out of small boxes painted yellow. Hide a prize under one and have players guess where it's found. 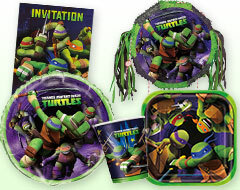 Bubbles and squirt guns are some fun summer party ideas for return gifts that the little kids will enjoy taking home. 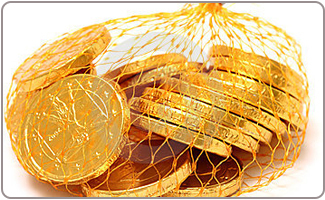 Hand out bags of chocolate coins for the guests to enjoy. 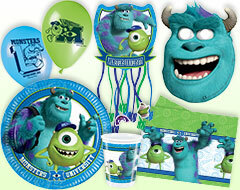 Create wonderful goodie bags from our selection of ready to use Super Mario party ideas for favors. Create your own goodie bags using small yellow bags with a question mark drawn on them, and fill them with treats and small toys. Mario and Luigi are two Italian brothers, so set an Italian feast with food like pizza and pasta. Make gold coin cookies with round cookies and yellow frosting. 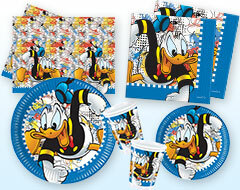 Serve up the perfect Super Mario birthday cake with one of the easy to use cake toppers from our supplies. You can also go for theme cup cakes with blue frosting and using colorful food coloring to decorate it with stars, coins and bricks. You may not want to serve real mushrooms, but make mushroom cupcakes instead! Frost with dots for an easy treat. Serve Italian soda as a tasty and perfectly themed beverage for your guests. 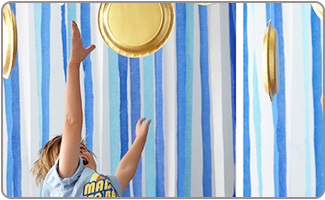 Hang gold "coins" made of paper from the ceiling. Paste yellow bricks at varying heights on the walls to look like the bricks in the original game. Decorate the tables with red and white checked tablecloths, just like an Italian restaurant and perfect for the theme. 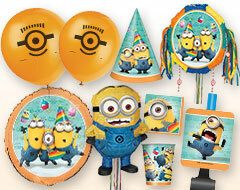 Choose from the great and easy to use supply of ready to go décor that will give you plenty of Super Mario birthday party ideas. Add some mushrooms to the décor – this staple of the Mario world can be found at garden décor shops. Hang up images of Mario and Luigi from the various games on the walls. 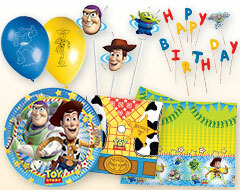 Lastly, dont forget to hang some party balloons with a mix of latex and foil balloons.